My name is Carol. I am a designer and a mother. I’ve been a drawer, a doodler, a maker of patterns and pictures my entire life. After Art college I had a successful career as a printed textile designer in womenswear fashion and homewears for over a decade. Then I had Max. Time after time I found I could never quite find what I was looking for on the high street, whilst trying to find cards and gifts for friends and their new arrivals. The answer was to design my own. This became the motivation for me to design a range whilst on maternity leave and just like that max made me do it was born. I had a very clear vision that the prints shouldn't look too babyish, naive or childlike, I wanted them to have a vintage and nostalgic appearance and to essentially stand the test of time and be something one could cherish right through from childhood to adulthood. A keepsake for life! Everything is hand drawn by me and every print is bespoke as the layout and design may change slightly so as to accommodate your requested personal details. Colours are inspired by retro and vintage finds and carefully chosen so the prints are not stereotypically coloured for girls and boys. 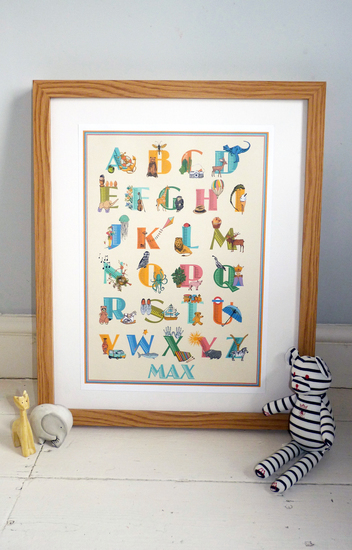 Max made me do it prints really make for unique and very special gifts that should appeal to little people and their parents too!